The Indian flag is very important for the people of India. It has a place of pride in the hearts of Indian people. The Indian flag is made from a special kind of fabric called Khadi which was made famous by Mahatma Gadhi, the father of the nation. It is also called “tricolor” thanks to the three colors that adorn it. India’s national flag is a national symbol. .It is a symbol of the unity of India which is a pluralist country. It was officially adopted in its present form during a meeting of the Constituent Assembly held on 22 July 1947. The flag was designed by Pingali Venkayyaand. 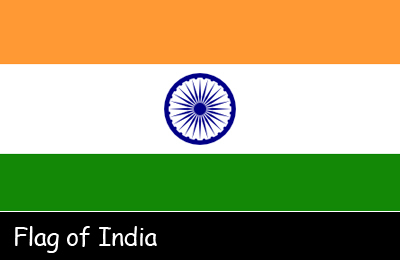 The Indian flag is a rectangular and horizontal flag. It features three equal bands of deep saffron, white and green. The bands are horizontal. The color saffron stands for sacrifice; white symbolizes peace, purity and honesty and the green stands for confidence and progress. Centered in the middle of the white, the navy blue wheel is derived from the Ahsokan pillar located at Sarnath near Varanasi in Uttar Pradesh. Sarnath is the place where the Buddha delivered his first sermon after he got enlightenment. The pillar was erected by the great Mauryan emperor Ashoka in the 3rd century BC. The diameter of the wheel, which has 24 spokes, is equal to the width of the white band. The flag’s width-to-length ratio is 2 to 3. Since its first inception, the Indian national flag has undergone several changes. French Revolution and its slogan of Liberty, Equality and Fraternity had profound impact on Indian nationalism. When the great Indian reformer, Raja Ram Mohan Roy, was going to England in 1831 he saw the flag of France waving on a French ship. The flag of France had three colors. The Sepoy mutiny in 1857, also known as the First War of Indian Independence, sowed the seeds of freedoms in Indians. When the struggle for freedom gained momentum in the 20th century, the need for a national flag was felt. Sister Nivedita, a disciple of Swami Vivekananda, was the first to conceive the Indian flag. It was on 7 August 1906 that in a rally organized to protest the division of Bengal province the tricolor flag was unfurled for the first time. The flag underwent changes over the passage of time. However, when the British decided to leave India, the national flag was uppermost in the minds of the Indian leaders. A flag committee headed by Dr Rajendra Prasad, who later became the first President of the Indian Republic, was formed. It was decided that the flag of the Indian National Congress, which spearheaded the struggle for freedom from the British rule, should be accepted as the national flag with some changes. The navy blue wheel, which is a representation of the Ashoka Chakra at Sarnath near Varanasi, was placed at the center of the flag. Indian National Flag was officially adopted in its present form during a meeting of the Constituent Assembly held on 22 July 1947. The Indian flag closely resembles the flag of Niger. The flag of Niger features three vertical and equal bands and has a small orange disk centered in the white band. Declan, Tobin. " Indian Flag Facts for Kids - ." Easy Science for Kids, Apr 2019. Web. 26 Apr 2019. < https://easyscienceforkids.com/indian-flag/ >.